Image adapted from the Bensussen family ketuba (ST00103), courtesy of Rabbi Solomon Maimon. A teachable moment: The use of mashallah is not odd at all. Far from it: it is in keeping with more than a thousand years of Jewish cultural expression. The only problem is that, although dynamic Jewish cultures developed in Muslim contexts, their experiences have been largely erased from American Jewish consciousness, from the field of Jewish Studies, and from our conceptualization of the Middle East today. 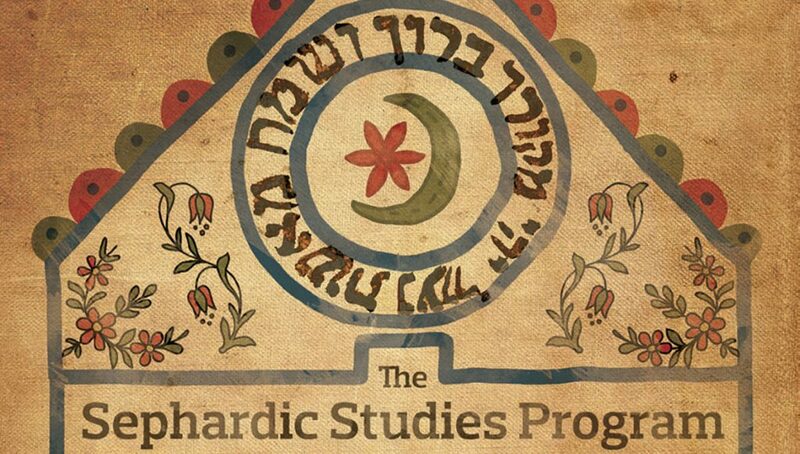 The Sephardic Studies Program aims to recuperate the experiences of those Jews left out of the discussion. Fortunately, the Stroum Center, bolstered by Henry M. Jackson School of International Studies and the new Benaroya Israel Studies Program, now houses one of the country’s most active Sephardic Studies initiatives which seeks to expand the parameters of the field while also honoring Seattle’s local Sephardic Jewish communities. 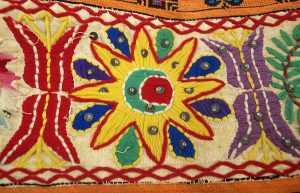 Fasha (Torah binder) with a crescent and star, Monastir (ST01153), courtesy of Elayna Youchah. We need go no further than Seattle to see how integral the expression mashallah remains to Sephardic Jews. In Arabic, Masha Allah literally means “God has willed.” In the Ladino language, formed through the fusion of Spanish, Hebrew, Turkish, Greek, Italian, French, and Arabic, the expression signifies praise and appreciation, and also protects against the “evil eye” — to be said when you see a baby or achieve a milestone (in the case of a book award). So ubiquitous is the term that the Mercer Island Stroum Jewish Community Center chose Mashallah! as the slogan for the 2017 Sephardic Day at the JCC. Seattle’s Ladineros, a group of community aficionados who have starred in International Ladino Day, composed a remarkable Ladino adaptation of “Little Red Riding Hood.” In their version, upon seeing the wolf dressed like her grandmother, the protagonist exclaims: “Mashallah, nona, ke dientes grandes tienes!” (Mashallah, grandma, what big teeth you have!). 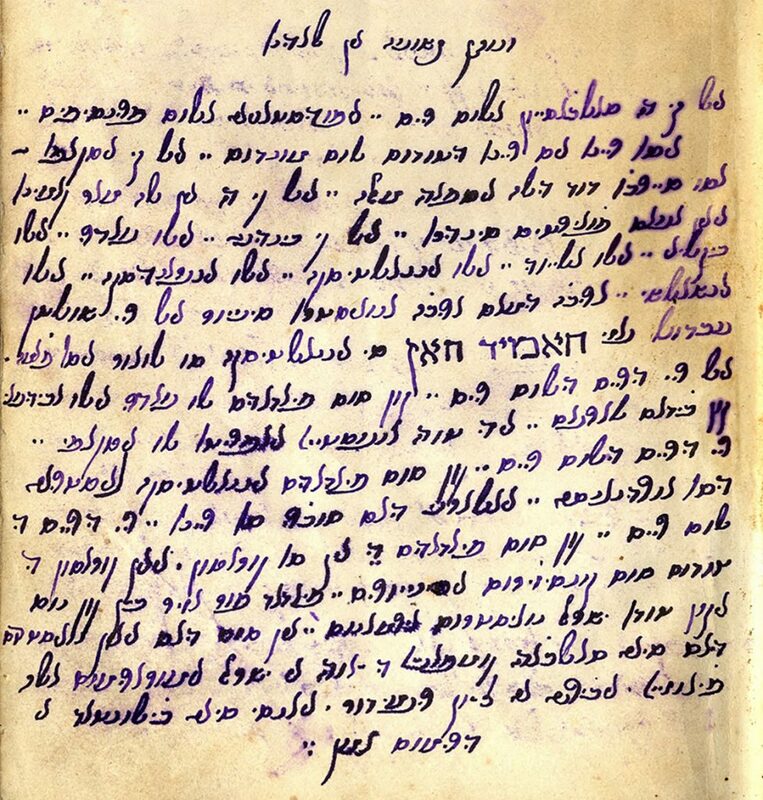 Now boasting over 1,200 items, including 400 Ladino titles, all maintained by our research coordinator Ty Alhadeff, our Sephardic Studies Digital Collection is overflowing with artifacts that make us think: the incorporation of the Islamic star and crescent on 19th century Ottoman Jewish wedding contracts, on a fasha (Torah binder), and on the finials of a Scroll of Esther; patriotic poems written in Ottoman Turkish in Arabic script by a Jewish soldier; a Ladino Prayer for the Government praising the sultan, who is referred to as gazi — a warrior engaged in jihad; a recording of a rabbi’s son chanting the opening verses of the Koran which he learned as a student in a Muslim school in Turkey; a Judeo-Arabic Passover Haggadah; and Ladino correspondence sprinkled with expressions like mashallah, including Claire Barkey’s dramatic letters from Rhodes that describe her family’s escape from the Nazis. Prayer for the government in Ladino honoring Sultan Abdul Hamid II (ST00874), courtesy of Fran Israel. Our public programs in 2017-8 also highlighted Jewish-Ottoman/Muslim/Arabic connections. Bryan Kirschen of CUNY-Binghampton delivered a lively talk about Ladino as an endangered language and current efforts at revitalization, in which he demonstrated that Ladino experienced its apogee in the Ottoman Empire. Eyal Ginio of Hebrew University delivered a packed lunchtime talk, “The Last Ottoman Decade: The ‘Other’ Ottomans,” in which he described how Sephardic Jews, including his own family in Jerusalem, were deeply embedded in their Ottoman context. This year’s Seattle Jewish Film Festival’s Sephardic Spotlight featured “Trezoros: The Last Jews of Kastoria,” a documentary that reminds us that even Jews born in the Ottoman Empire perished in Auschwitz. Our students continue to push us to expand the boundaries of Jewish Studies. Among the 2017-18 Jewish Studies Graduate Fellows, several projects address Jewish-Muslim connections. They involve the study of Ladino in Seattle; the fate of Jews in 20th century Egypt; and the influence of Arabic musical modes (makam) on Sephardic Jewish music. Jewish Studies minor Annie Lewis won this year’s UW Libraries Research Award Grand Prize for her thesis, “Precarious Whiteness: Reimagining the Seattle Sephardic Origin Story.” She demonstrated how Sephardic Jews’ origins in the Muslim world led them to be subjected to discrimination by fellow (Ashkenazi) Jews. We still have a long way to go to fully acknowledge and embrace the variations of the Jewish experience, but we are making serious strides here at the University of Washington. We will continue to insist that modern Jewish history, politics, literature, and philosophy is not only about Europe, America, and Israel; that the Holocaust impacted the Jews of the former Ottoman Empire; that “Jewish” cuisine includes gefilte fish and borekas; that Jewish humor existed beyond the shtetl. Thanks to the continued generosity and commitment of community supporters, future Sephardic Studies public programs, courses, and research projects will continue to enrich and expand our understanding of the multiplicities of the Jewish experience — until mashallah will be recognized as just as Jewish as mazel tov. Editor’s note: This article appeared in the “Unique Areas of Expertise” section of the Stroum Center’s Jewish Studies Impact Report, Autumn 2018. View the entire report here. Well done, Devin. Regarding the use of MashAllah, I read somewhere that it means ‘May G-d Preserve!’. However, the way that it was used in the Sephardic community as I was growing up was as ‘Congratulations’, ‘Wow!’, ‘That’s wonderful’. For example, one would say ‘My son graduated from the University of Washington with honors’. The answer invariably would be ‘MashAllah’.